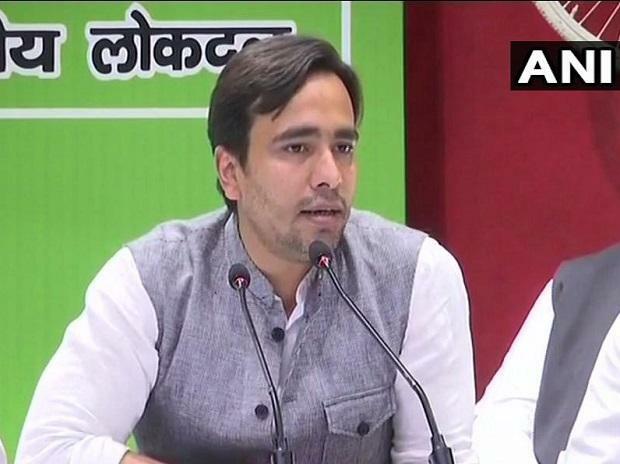 The SP-BSP-RLD alliance in Uttar Pradesh had no accommodation problems and is battle-ready to take on the BJP in the Lok Sabha polls, RLD vice president Jayant Chaudhary said Sunday, asserting the tie-up was made on workers' feedback and not through a "top-down process". Samajwadi Party (SP) chief Akhilesh Yadav announced last week that the Rashtriya Lok Dal (RLD) will contest three Lok Sabha seats -- Mathura, Baghpat and Muzaffarnagar -- as part of the alliance with the SP and the Bahujan Samaj Party (BSP). In an interview to PTI, Chaudhary said his father and party president Chaudhary Ajit Singh has announced his intention to contest from Muzaffarnagar, while he was keen to take up the electoral challenge in Baghpat. He said the party will take a decision on Mathura soon. Asked how the workers of the three parties will be able to connect at the ground level with the seat-sharing talks having taken a long time, Jayant said he believes regional parties have a better connect with their workers. "This alliance decision was not a top-down process but in fact taken after feedback from workers and leaders. That is why you haven't seen problems in accommodation and adjustments between the BSP, SP and RLD. This means that the ground is already ready for us. Now we just need to keep up the campaign," the 40-year-old leader said. On the equation between the Congress and the grand alliance in UP, Chaudhary said the issue had been addressed at the recent press interaction in Lucknow and he did not have any more information on it. After repeated questions by reporters at the press conference, SP chief Akhilesh Yadav had said the Congress was "very much in the alliance". "We have left two seats (Amethi and Rae Bareli) for the party (Congress)," he had said. Jayant, grandson of former prime minister Chaudhary Charan Singh, said the electoral contest between the opposition and the BJP would be a "make or break" for the right idea of India. "The mainstreaming of violence, the 'othering' of our minorities and weaker sections, the saffron washing of our cultural heritage, the nonchalance with which even our intelligentsia is ready to dismiss diverse opinions, the intentioned and sustained attack on institutional credibility, make this a make or break for our idea of an inclusive, progressive, developing Bharat!" he said. Asked about the narrative of Modi versus the rest and the BJP's "mahamilavat" (highly adulterated) barb at opposition alliances, the RLD leader said the fact is that the diversity of India can have true political representation only through alliances. The BJP also ran a government in alliance with many parties and will have tie-ups in many states including UP, he said. Slamming the BJP for the Modi versus the rest narrative and the "mahamilavat" jibe, Chaudhary said leaders don't walk alone, they build a team of capable leaders and this has been Modi's "big failure" in government. "We know that he likes to work alone and walk alone, but India needs a leadership that listens to feedback, collaborates with others and respects diversity," he said. Hitting out at the use of the term "mahamilavat" by Modi and the BJP, he said it betrays a "negative mindset". "The notion of purity was the basic foundation of caste oppression in India. To imply that the opposition is impure, to me, this slogan uses the language and symbolism that divided our country into castes and that is why I strongly object to it," he said. Asked whether national security and the post-Pulwama airstrikes will be the major issues in UP or the alleged agrarian distress, Chaudhary said it is the "jawan and kisan who have borne the brunt of the myopic and adhoc policies the incumbent government has unleashed over last five years". "Therefore, both will feature prominently. Note ban had a debilitating impact on rural livelihoods, and economic activities in our hinterland. Farmers have faced rising input costs, depressed produce prices and diminishing returns," he alleged. Rural labourers and artisans, as well as dairy farmers have also suffered. They are not willing to listen to a government that gives "paltry sums" on the cusp of elections and "trumpets empty failing schemes" like the kisan bima yojana and the soil health card, he claimed. "National security has been a major failing of this government. We have been subjected to more attacks, lost more jawans than before and it still appears we have no comprehensive policy on Pakistan. Our responses should always be measured and fit with our larger, long term geopolitical and security strategy," he said. Instead, there has been only a reactive policy from this government, the RLD leader alleged. "The 'shaheed' status demand, OROP and issues highlighted by para- and retired forces' welfare associations will be addressed by us if given a chance," he asserted. On Priyanka Gandhi Vadra's entry into active politics and the impact of her campaigning, the RLD leader said he was not privy to what has been planned in terms of the Congress campaign, and cannot comment on the impact. "But, I think there is a positive energy that people attribute to Priyanka ji so it's good that she has decided to take the plunge. Look forward to her intervening especially on issues relating to gender equity and women's welfare which I believe are underrepresented in the mainstream politics," he said.